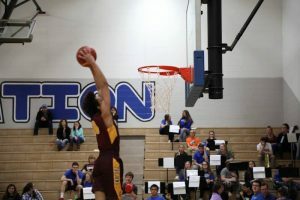 Senior Caleb Muia rises up for the slam, Monday, Jan. 14, in the Trojans matchup against Neodesha where the Trojans remain unbeaten after a dominating 60-26 victory. PC: Ron Gates. Following a convincing 60-47 win over Frontenac, the 3A #1 Girard boys (7-0) kicked off the Wilson County Classic against a struggling Neodesha (0-7). Junior Ryder Worrell is still listed as inactive after suffering a leg injury in the Trojans’ matchup against the Raiders. But that didn’t stop the Trojans from piling on the score. Girard came into the game with a noticeable size advantage as Neodesha had no answer for the post play of seniors Carter Doherty and Caleb Muia. The Trojans stifling defense only allowed the Blue Streaks to one point in the first quarter as it became all Girard from the tip. The Blue Streaks would make a run just before the half, but Girard would lead by 21 at halftime with a 37-16 lead off a stellar 10 points from Muia. Doherty bullied the Blue Streaks team down low in the third scoring 10 of Girard’s 16 points for the quarter. Girard went on to defeat Neodesha 60-26 as a running clock ensued and starters were taken out giving the younger Trojans an opportunity to see the court. Senior leadership has become vital to the Trojan’s success this year as multiple players finished double-digits in scoring; Muia (15) Doherty (14). Sophomore Logan Thomas made a key impact as well finished with 8 points off the bench. “It’s good to get out to that big lead early, and it’s great for our young guys…we can chalk this one up and move onto tomorrow,” said Coach Rod Wescott. The Girard boys (8-0) are scheduled to play in semifinal action today, Jan. 15, at 3:15 against the Bluestem Lions (6-4).